the Erzgebirgische (Ore Mountain) region. The Arctic Santa by Steinbach is the twenty-third Santa nutcracker in the “Christmas Legends Series". This limited edition is the newest release in the longest running series of Steinbach nutcrackers that dates back to 1993. We stock a number of older releases from this series. 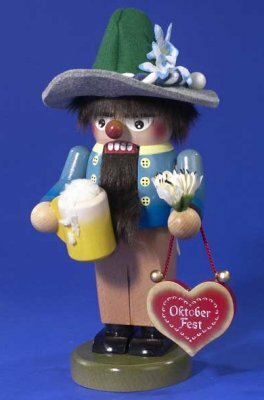 This Octoberfester is a Bavarian nutcracker design by the respected firm of Christian Steinbach GmbH, and is part of an extensive offering of Steinbach Chubby nutcrackers. New ownership of this well-known firm occurred in 2016. Most of these nutcrackers have been signed by the previous family owner, Karla Steinbach. This Santa nutcracker is covered in genuine Swarovski Crystals and is part of a new generation of nutcrackers made in Germany by the respected Erzgebirge firm, KWO. This Shill’s Hussar is just one of several traditional nutcracker designs by the respected firm of Kunstgewerbe-Werkstätten Olbernhau GmbH, better known simply as KWO. Their designs are made in the Erzgebirge region of Germany. These classic designs depict the staunch upright figures of authority that have long been a traditional in the Ore Mountains. 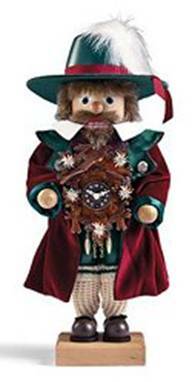 This handsome Black Forest Clockmaker nutcracker was created in the workshops of Christian Ulbricht. This limited edition nutcracker from Christian Ulbricht, holds a real, working five leaf cuckoo clock in his hands. Limited Edition of 2,500.